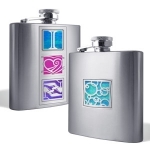 Find cool flasks for men & women personalized with over 500 artistic flask designs, gorgeous colors, and custom engraving - from cute flasks for women with animals or flowers to custom flask sets for guys with sports or car themes. Whatever the occasion and whoever you're shopping for, Kyle Design has the perfect flask for you. Classic engraved flasks are great for weddings, anniversaries, birthdays, and graduations when you want to make a splash with a standout personalized gift. 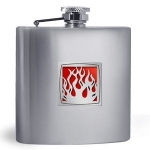 Customize your own flask - click Customize My Flask to choose any size flask and add a design that reflects you. Then, pair it with your favorite color and even engrave it to create a one-of-a-kind party flask that will get you noticed. Fast turnaround - perfect for hip last-minute gifts. 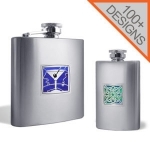 Unique liquor flasks for alcoholic drinks, wine, spirits, whiskey and water personalized with custom choice of 100's of cool designs, aluminum or iridescent color and custom engraving. Choose from a wide selection of stainless steel funnels, shot glass or cup, folding collapsible cups, & belt hook flasks, too. Custom Flasks: Select size, polished or brushed finish, design and color for a customized flask suited to your tastes. Striking collection of engraved, Celtic, monogrammed, pink, black leather, key chain, patterned or slim flasks for men and women. 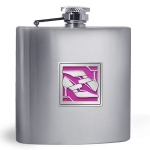 Engraving: In-house engraving services - have flask monogrammed or engraved with a name, date, personal message or company logo. Want a cool quote to engrave? See Engraving Quotes. For a classic gift that never goes out of style, consider our original hip flasks for women and men from Kyle Design. 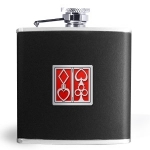 Perfect for wedding favors, bridesmaid or groomsmen gifts, 21st birthday presents and other special occasions, every cool flask is individually crafted to order with your personalization options so you can celebrate any event in style. It's easy to get started - simply select the flask size of your choice, then personalize it with an artistic design image that reflects your personality or interests. Top it off with a vibrant splash of color and optional customized engraving for a unique gift that's as one-of-a-kind as you are. We have an extensive selection of drinking flasks and barware accessories that can be customized any way you want it, so if you're in search of the perfect gift for yourself or a loved one, you're sure to find something even the most hard-to-buy-for man or woman will love. Not sure what size flask to buy? Whether you're looking for cute flask accessories for social drinkers or large flasks to cure anyone's thirst, check out Kyle Design's custom drinking flasks in a wide variety of popular shapes and sizes. For tips on how to keep your flask looking like new, please review our Stainless Steel Flask Use and Care Instructions. A great decorative accessory for a purse, backpack or messenger bag, our cool key chain flasks make creative gifts for friends on Friendship Day or fun travel souvenirs - commemorate a family vacation or life-changing trip abroad with personalized flask key chains featuring our Eiffel Tower, palm tree, airplane and cruise ship designs. For an extra special touch, have your traveling dates or destination custom engraved on the back. For a discreet night cap or emergency shot, browse our stylish skinny flasks that can easily be tucked inside a pocket or purse for easy access. An attractive alternative to miniature liquor bottles, these mini flasks make wonderful gifts for your boss, co-workers and Happy Hour buddies during an office party, potluck or Secret Santa gift exchange. For those times when a sip simply isn't enough, consider our stylish wide flasks that offer a larger 4 ounce capacity and safety caps (captive tops) at a size that's still conveniently compact. When you're really thirsty or buying a meaningful commemorative gift for someone, have a look at our best selling large flask styles in useful 6 ounce and 8 ounce sizes. An excellent milestone birthday gift for the newly-turned 30 year old starting a new chapter in life or retirement present idea for grandpa, our flasks also double as BPA-free stainless steel water canteens and thermos bottles for non-alcoholic beverage drinkers. 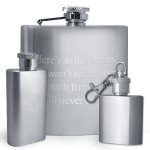 If stumped on a gift solution for a twenty-first birthday or wedding anniversary, look no further than a unique flask set complete with a matching funnel, shot glass and your heartfelt message engraving for best wishes. Be creative when you design your own "his and her" wedding flasks for a bride and groom, or surprise mom and dad when you toast their 25th anniversary with a matching set of beautiful custom flasks. To create your own gift set, shop our stainless steel flask accessories to add cool funnels, mini collapsible cups and wine bottle stoppers to your personalized flask. 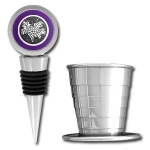 You can also choose our round flask gifts that feature a hidden pull-out shot glass cup and arrive in a black gift box for convenient and easy gift-giving. If shopping specifically for a decorative designer flask, check out Kyle's signature collection to personalize your own artistic flasks in hundreds of creative designs and theme images. You can also view our best seller flasks for winning flask gifts that are sure to please. Animal, Pet & Wildlife Flasks adorned with cute cat and dog, sea life, wild animal, livestock, bird and insect image themes are excellent for anyone with a soft spot for animals. Commemorate your favorite pets with a customized dachshund, chihuahua, horse, turtle or fish design or create your own zoo animal flask with penguins, polar bears, tigers, giraffes and wolves. If you use a fun pet nickname for a loved one, have your cool monkey, love bug, bear, kitten or honey bee flask engraved with his or her nickname for a funny anniversary gift or thoughtful present idea. You can also select from cool fantasy creature themes with dragons, mermaids, fairies, vampires and aliens. Floral & Nature Design Flasks are sure to impress gardeners, botanists, florists, nature lovers, environmentalists and more. Choose from a wide assortment of flower designs with our iris, orchid, sunflower, rose and daisy patterns, or opt for an elegant tree of life flask to represent family, wisdom and strength. 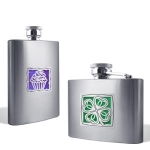 We also have popular shamrock, bamboo and food images with fruits, chocolate desserts, chili peppers, margaritas and wine so you can design a unique flask for foodies, chefs and caterers. 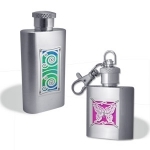 Designer Liquor Flasks feature unusual patterns of Celtic knots, Fleur de Lis and ankhs as well as distinctive Chinese character symbols for love, faith and harmony. Great for anyone who appreciates striking designs, these exclusive flasks in retro, modern and contemporary themes are sure to please any stylish man or woman - makes a wonderful gift-giving solution for White Elephant exchange games (where you're not quite sure who your recipient is!). Unique Flasks for Professionals can be custom engraved and given as handsome employee service awards or thank you gifts for clients and volunteers. Our collection of cool professional flasks includes a variety of job themes, from doctors, nurses and dentists in medical careers to artists, personal trainers, realtors, veterinarians, architects and more. Whether you're wanting to thank your hairdresser or trying to find a present of appreciation for your secretary, you can't go wrong with our unique selection of profession flasks. 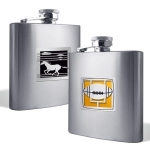 Hobby & Sports Flasks are sure to be appreciated by anyone who wants to show off their passion. If you're an athlete, knitter, car enthusiast, poker player or sports fan, we have the perfect sport themed flask that's right up your alley. Consider a cool rowing flask for yourself or matching crew flasks for your teammates; you can even engrave the back with a winning tournament date, MVP name or team cheer for a special touch. When gift shopping for family, our sophisticated golfer flask will become dad's new favorite accessory while mom's sure to love our fun scrapbook, quilt and knitting patterns for a cute "nip and knit" flask idea. 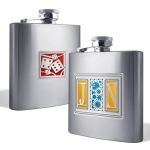 Themed Flasks for men and women feature both contemporary and nostalgic images that will leave everyone smiling. Customize a novelty flask as a gift to yourself or a loved one with popular Egyptian eye, crown, firework, peace sign and horoscope designs, or personalize a commemorative flask for a funny inside joke you share with a loved one. Flasks for Women come in an assortment of lovely styles and colors to suit every woman's taste. Personalize your own purse flasks and pocket flasks with beautiful heart, flower, princess crown and butterfly designs for the little lady in your life, or create your own designer bridesmaid gifts with wonderful wedding flasks in decorative wedding bell and diamond ring images. You can also have your flasks engraved with your wedding date, names, monogram or sentimental message to make your heartfelt gift all the more memorable. If you prefer the simplicity of plain engraved flask styles, check out our large selection of personalized leather flasks and stainless steel flask accessories that can be customized to you with an optional engraving message, inspirational quote or personal monogram. Flasks By Size Want the coolest drinking flask? Shop 500+ cool flasks customized with your favorite color & engraving in 8oz, 6oz, 4oz, 3oz, 2oz, and 1oz sizes plus round and keychain styles featuring Kyle's exclusive flask designs. Whether you need a mini flask you can store on your keychain or hide on your purse or boot, or you're looking for a large party flask that holds 6 or 8 ounces, we have the perfect flask for you! Choose the right size for your occasion - wedding, birthday, graduation, or other gift-giving holiday. Our fast turnaround means you'll get your flask in time for your big event. To see a huge variety of Kyle's unique designs, check out Cool Flasks by Theme. Add any design to your favorite flask by clicking Custom Create My Unique Flask Now.